Mike Gardner put himself through college working as a chef in a four-star Italian-American restaurant. But he hadn't decided on a long-term career when he entered Miami University in Oxford, Ohio. Then he took a class in physical distribution management with professor Thomas Speh, and lightning struck. 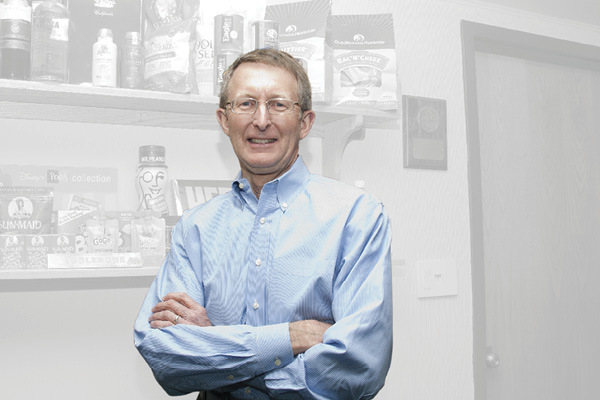 "That class ignited my passion for what's now known as supply chain management," Gardner says. "I was intrigued by the science behind it. It fascinated me that you can apply analytics and statistics to a mundane process that most people don't even think about—bringing us all the goods we buy." Until his death in April 2016, Speh remained an important friend and mentor, and that class helped launch Gardner on his career path. That path took its latest turn after Gardner retired from an executive position at Exel Logistics (now DHL Supply Chain Management). He planned to do some teaching, but then got a call from the Kane family, owners of Kane Is Able, a large, asset-based third-party logistics service provider based in Scranton, Pa. The Kanes wanted Gardner to become the company's president and chief executive officer. Gardner assumed the post in January 2015. Inbound Logistics recently spoke with Gardner about his leadership priorities and some of the more striking aspects of his work. IL: When you arrived at Kane Is Able in 2015, what was your first order of business? One thing I've learned in my career is that when you start a new assignment, you need to take a deep breath and say, 'There's no agenda for 90 days.' Exel had competed against Kane, so I knew of the business, but I didn't know it from the inside. I needed to meet the team, so I visited all 26 of our operations. I met with customers, many of whom I'd worked with over the years, because I've been in the industry a long time, and we all tend to move around. We conducted a customer survey to establish benchmark metrics, and did what we call a culture survey, to find out how our associates were doing. The data we collected in those surveys identified which issues to attack. There's no sense trying to effect change if you don't know what you're trying to change. IL: What's the biggest challenge your customers face these days, and how is Kane helping them deal with it? It's the same challenge that companies have faced throughout my entire career—the cost/service tradeoff. Everybody wants things faster and cheaper. Today, because of Amazon's influence, the drive for better service is even more intensive. Everyone asks, 'Can you do it for me cheaper?' It helps that Kane has a large truck fleet, and that we offer flexibility through both dedicated and shared-use facilities. I believe in building a great team and then getting out of their way. I'm paid to help set the company's strategic direction, interface with customers, and grow this business. I'm not the CIO, or CFO, or human resources lead. I need to let those people, and other team members, do what they do best. Over time, I've gotten pretty good at selecting great talent, helping to develop them, and providing opportunities. While everyone makes an occasional hiring mistake, the key is to act quickly—put the person in a different role or tell them they need to do something else. Over time, you learn what good looks like. IL: What other lessons have you learned that have helped shape you as a leader? I've learned that it's not about me. During my second week at Kane, we held our annual management meeting. At the kickoff dinner, everyone was excited to meet the new CEO. But by day 2, they were still deferring to me. I said, 'Look, it's not about me. It's about our teams—our drivers, our lift operators—who provide service for our customers. Quit talking about me and asking what I think.' Other people could do my job, or any job. The key is to do the best you can, but don't get overly focused on yourself. IL: What was the strangest assignment to ever come your way? But we did it. We trucked the 748-pound piece of limestone, quarried in Bloomington, Ind., to Chicago and flew it to Rome. I was there when the Pope blessed it, right after a Wednesday audience. Then we flew it from Rome to Los Angeles, and trucked it up to Santa Paula for the installation. IL: What's the most fun and exciting part of your job? Engaging with associates and customers. We hold celebrations throughout the year for our associates, and everyone gets involved. For example, as part of Driver Appreciation Week at our headquarters in August 2015, we brought in a dunking booth. People paid to dunk a manager, and we donated 100 percent of the proceeds to Pelotonia, a bicycle tour that raises money for cancer research. The Kane family matched every dollar we raised. I was first in the dunking booth, and former board member Chris Kane went second, followed by all the distribution center managers. When the manager of DC 3 on our Scranton campus stepped up, 35 of his first-shift associates came to put him in the water. My administrative assistant couldn't throw the softball hard enough to knock me in, so she just ran up and pulled the lever. We had a great time. Having seen the distribution problems that plagued relief efforts after Hurricane Katrina in 2005, a group of logistics leaders came together to form the American Logistics Aid Network (ALAN). Their goal was to coordinate the efforts of logistics operations so they could send help, quickly and efficiently, in the wake of future disasters. Mike Gardner has participated in ALAN for several years, and in 2016 he joined its board. One aid effort that got his support was a response to the April 2016 earthquake in Ecuador. "We did some work out of a number of Kane operations, including the one where we serve Kimberly-Clark in the Chicago area," Gardner says. "Kimberly-Clark provided great support. We palletized and bundled their donations, and United Airlines donated some air cargo space. They flew the cargo to Miami and then down to Ecuador." ALAN members also pooled resources to truck bottled water to residents of Flint, Mich., when lead contamination was detected in the local water supply. "If every company gives five trucks, it's much better than asking one to provide 10 or 20 truckloads," Gardner says. "It's just a matter of using our various contacts, and everybody giving a little bit to help solve a problem."